Happy Holidays, and Goodbye 2006! I'm short on time today as we're heading on the road tomorrow but I wanted to get some content up for you before the year was out. Click HERE to listen to the Brad Herman interview in it's entirety from the 93.3 The Peak FM Bulldogs Broadcast. 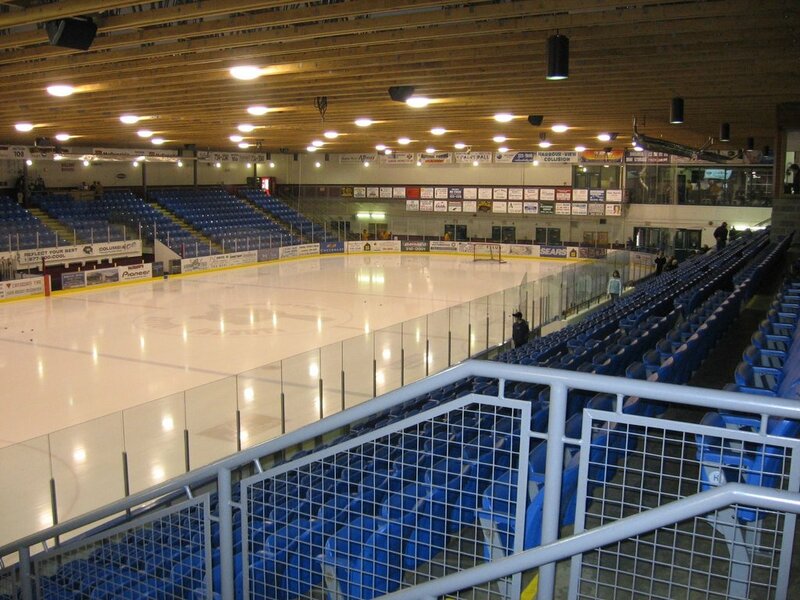 Also before I go, I'd like to promote the big International Midget Tournament on this weekend at the Multiplex. For local fans that miss hockey, it will be some great action at the rink with the Dogs on the road this weekend, and best of all, it's FREE. You will find the tournament sked and results and stats there. Kudos to THE PEAK for being on board as a sponsor, and the Alberni Valley Times as well. Here's an interview from the 93.3 The Peak FM morning show that I did on Wednesday with "The Ace" - my former partner in crime on the broadcasts and now coach of the team, along with players Justin Brooks and Clayton Hawkins. Good luck to the Timbermen and all teams, and I encourage local fans to get out and watch some great free hockey! Thats about it for me, more to come in 2007! Hello and thanks for stopping by. Well here it is at 5:23pm Thursday night after getting going at 4:30 this morning and working ever since. Sitting down to enjoy a "Wint -o-Mint" Hot Chocolate from Serious Coffee. There I am enjoying my great winter beverage sitting and relaxing, checking some hockey on the tube. I have to be at the radio station in 37 minutes to tape an interview with Brad Herman for the Bulldogs Broadcast Friday night against Powell River. I think, "what should I do before I have to go back to work to interview Herms?" Ahhhhh, the BLOG. Yah yah yah I've had more than a few people taking shots at me lately about my lack of blog postings. Just off the top of my head we've got Katie, Dan, and Barb all chirping me for slacking- haha. Danthestatsman said over lunch "something something something blog.........not that you would know what a blog is Hammer" - HA. Barb sent in a funny email last night with the subject line of "Vernon!!" "Taps playing..........Your Blog is dead!.......Taps................" So, without further ado, lets get down to it. First off thanks for the motivation to get on here and post. I appreciate that you let me know you check this out and would like some material. It's stuff like that that keeps me going. I try my best to make the postings at least have some worthy material and discussion- not just fluff. Since the blog was dormant so long in VERNON, lets go back there. That night in the second intermission on the broadcast Devin Timberlake was my feature guest. Click the below link to listen to that interview, in it's entirety, from the 93.3 The Peak FM Bulldogs Broadcast. It's always great to hear of the players that have moved on and how they enjoyed their time in the Valley, isn't it? I have Brad Herman coming up Friday night and I am working on Joe Scali, Doug Krantz, Brian Stewart, and any others I can think of or people can link me up with. Don't hesitate to email me with a phone number or email addy and I will do my best to track the guys down. I'm taking a BIG STAB at making this work- embedding a video. This is one of the most amazing performances of a crowd that I've ever seen. Only the closing of the Montreal Forum and the ovation for Maurice Richard tops it. 5 minutes or so for Saku Koivu, when he returned from Cancer. You don't have to be a Habs fan or a Koivu fan to appreciate his battle, and more importantly, THE FANS. It's amazing the three of four times the public address announcer tries to talk and the crowd just ROARS him down, amazing. Here goes nothing..... EDIT- alright, 3rd time a charm I managed to get the video to work! Sunday afternoon it's the Surrey Eagles, and the canned food/non-perishable food drive. Bring those items to the door and you'll get paper for the airplane toss to win a turkey. Get on your feet before the puck drops before the game and before the periods. That's a request from Harry Zolnierczyk and the players as a whole. You have no idea how much it gets the guys going. Home ice, every bit helps. Harry recently told me he's been banging his stick on the glass behind the bench trying to get the fans going the last couple of home games. With Harry out the guys will miss that energy, so do all you can please. HOME ICE- every bit helps. That's all I have for now. Always open for ideas, submissions, suggestions, and so on and so forth. Drop me a line HERE I PROMISE that I will post sooner next time. It's 5:50pm now and I have to be at The Peak by 6:00pm, must hustle! EDIT- Now 6:01pm by the time I got the video to work...sorry Herms!